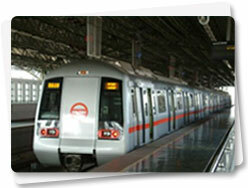 As we know that Delhi metro rail corporation provides the Travel Card that most convenient for the frequent commuter. Same like this Delhi metro rail corporation provides the Tourist Card that most suitable for tourists. Using this card one can travel unlimited time within short periods. Presently Delhi metro rail corporation provides two kinds of tourist cards - For 1 day and 3 day.